It's times like these that remind me why I need to stop hoping for things to happen and to focus on having the confidence to make them happen -- no matter what life throws my way. Have you ever worked so hard your fingers are swollen? I'm sitting here typing this with a tired mind, a sore back and throbbing feet. Yes, I don't even have to take a step for them to hurt right now. I moved this past weekend into a comfortable condominium that just so happens to be perched on top of a rather large hill overlooking Hermosa Valley. It's such a steep hill that when I pointed to it, I swear I heard the three Russian guys who unfortunately scored my moving job curse me under their breath. I can't imagine how sore they must be feeling right about now. As I unpacked my entire home and in some ways my entire life, I found myself hoping I would complete this post. I had initially made a personal commitment to write this blog on a weekly basis (coming out every Tuesday, of course) starting in 2016. And then life threw me another curve ball. Literally, days after I made this personal goal, my landlords gave us 60 days notice right before the holidays so they could renovate and move back in. I've been wanting to move for years so in one way, this was a blessing in disguise. But it still took time I hadn't planned on devoting to a move right now. What I really wanted to do was work on this blog and my original TV pilot with every free moment I have between working for a living and being a wife and mom. So as I unpacked box after box, I found myself hoping that my writing goals weren't going to go by the wayside like so many times before when illness struck, motherhood arrived and financial strife arose. But then I realized something has changed in me since then. I believe it was the fact I made a decision -- a hard fast commitment to make these goals regardless of what life threw at me. I stopped hoping that it would work out and I started making it work out -- no matter what -- evidence exhibit A being this here post you're reading right now. It's amazing what can happen when you don't give up to hope. You learn things like swollen fingers can still type and a tired mind still has something to say. That doesn't mean I haven't been challenged by this move. You don't get this sore by merely pointing to where all the furniture should go in the room. I worked way too hard to get out of our old place by the 31st so we didn't have to pay double rent. My husband even suggested that I ditch my post this week. He reasoned that my readers would understand if I missed it because of circumstances like this. I then started to hope that he was right and you all would understand why I didn't get this week's issue done. 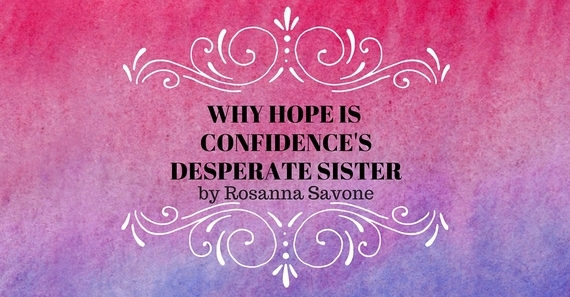 But then I remembered something about hope I learned many years ago -- that hope is confidence's desperate sister. And desperation never attracts anything good you want. Don't get me wrong. I think having hope is better than despair. But let's be frank here. That's not really setting the bar too high. Hope is really nothing more than the belief that something (even something good) could happen to you but you're not quite sure if it really will or should happen for you. So like a desperate beggar, you quietly wish for the thing you hope for. But once I made a decision that this week's issue was going to happen regardless of how tired or sore or swollen my condition currently is, something miraculous happened. My hope for this goal to be achieved turned into confidence. Now confidence is related to hope like a sister but they differ in that confidence is hope plus faith. You have confidence when you believe you will get what you want despite the very real possibility that it won't work out like you planned. Once I had confidence, instead of hoping that I can make these words happen, I started to plan on making them happen. 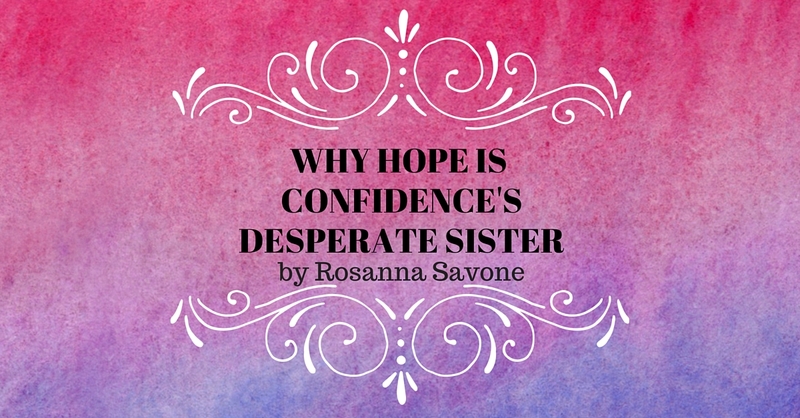 Unlike the desperate wishful thinking that goes along with hope, my brain went into solution mode because I had confidence I could and would get it done. Because confidence invokes bold action. And like magic, instead of focusing on hoping this post would happen, solutions began to appear -- in the shower, on the way to work, while watching my son in karate class, etc. I figured out the only time I could get it all done. Besides, I reasoned, my swollen fingers need a rest from all the unpacking that remains to be done. And then I got it done. I made my point and I made my goal. So it's times like these that remind me why I need to stop hoping for things to happen and to focus on having the confidence to make them happen -- no matter what life throws my way. Because who wants to live a desperate life anyway?